Here comes the Precista PRS-82! 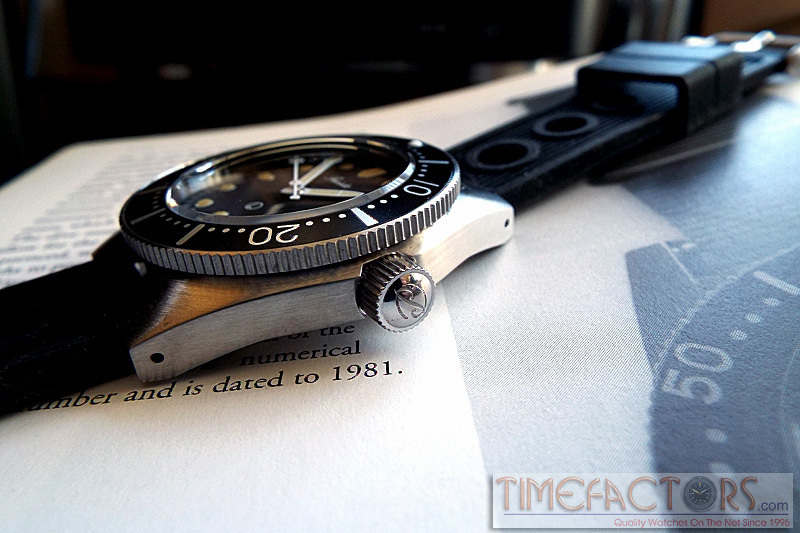 It’s been a busy year for Timefactors, with the release of a few hotly anticipated watches. We have seen the Smiths PRS-68 – a superbly executed homage to the cult status Seiko 6105 dive watch and the bronze PRS-30 – a monster of a watch which had been conceived way back in 2008. Quite soon we will have the Dreadnought Voyager – a GMT version of the classic Dreadnought which I reviewed back in 2003. Lo and behold, Timefactors have managed to source 200 new old stock 2783 movements with which to power the 82! This version is the slightly better 25 jewel variant (the original used a 21 jewel version though I have seen an image of one with the 25 jewel version) than the original and all have been cleaned, oiled and regulated. Hacking, handwinding and beating at a medium pace of 21,600 bph – a perfect choice of movement or put another way, a perfect choice of watch to build with the movements in hand! As many will know, current Precista watches are usually updated and upgraded somewhat from the watches upon which they are based – the PRS-82 is no exception to this and features a unidirectional 120 click bezel along with a 3mm domed sapphire crystal with anti-reflective coating to the underside. The crystal is noteworthy due to its double dome; when viewing the watch at an acute angle one won’t be plagued by a myriad of reflections and distortions – and of course it won’t scratch. The bezel appears to be a satin black with silvered markings and luminous dot under plexi at the 12 position; standard stuff and providing they are available, insert replacement shouldn’t be a big problem. Casewise, the PRS-82 has a totally brushed finish to all top surfaces; eminently practical for DIY refinishing. It looks to be a reasonably coarse finish so blending out scratches should be a snip. Whilst I only have the images (used courtesy of Timefactors) to go by at present, they seem to attest to a good build quality – for example, as can be seen the movement is secured by virtue of a metal holder along with screws to affix the same. The requisite screw down crown is there (this is signed and polished) and looks to be possibly a tad chunkier than the original. Water resistance? 200m of course so there are no worries about wearing this watch 24 hours, 7 days a week. Proportionally, it all looks good in the images with the chances being that in the metal it will look even better. 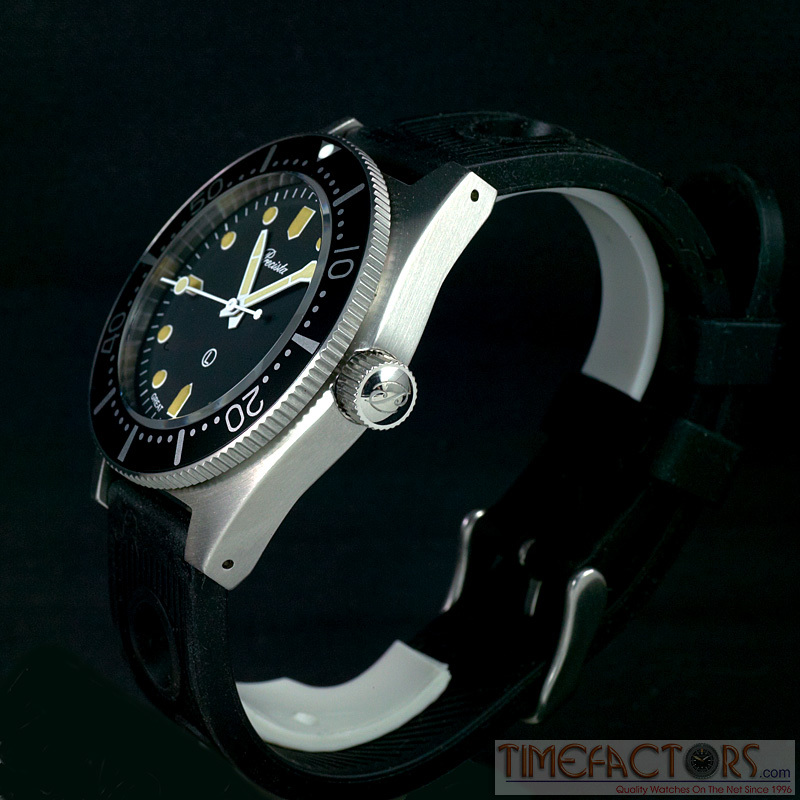 The asymmetrical nature of the case design was par for the course for a plethora of military watches of the period – there is a relationship between them (Racine, Gallet et al) but this design was perhaps the simplest, being only just asymmetrical when compared to the likes of the ADANAC / Gallet Navigator and so on. The exagerated asymmetrics of the latter are fine but make for a watch which wears larger than its diameter would suggest. The PRS-82 is a nice, old fashioned 40mm across the bezel, with a 29.5mm visible dial which should ensure that it is suitable for all but the tiniest of wrists. Thank you Timefactors for not bloating this design! Likewise, the thickness to the top of the crystal is a whisker under 14mm – smack on that of the original, which itself wasn’t a thick watch by any means. In esssence, this won’t be a dive watch which wears like a stack of saucers on your wrist. 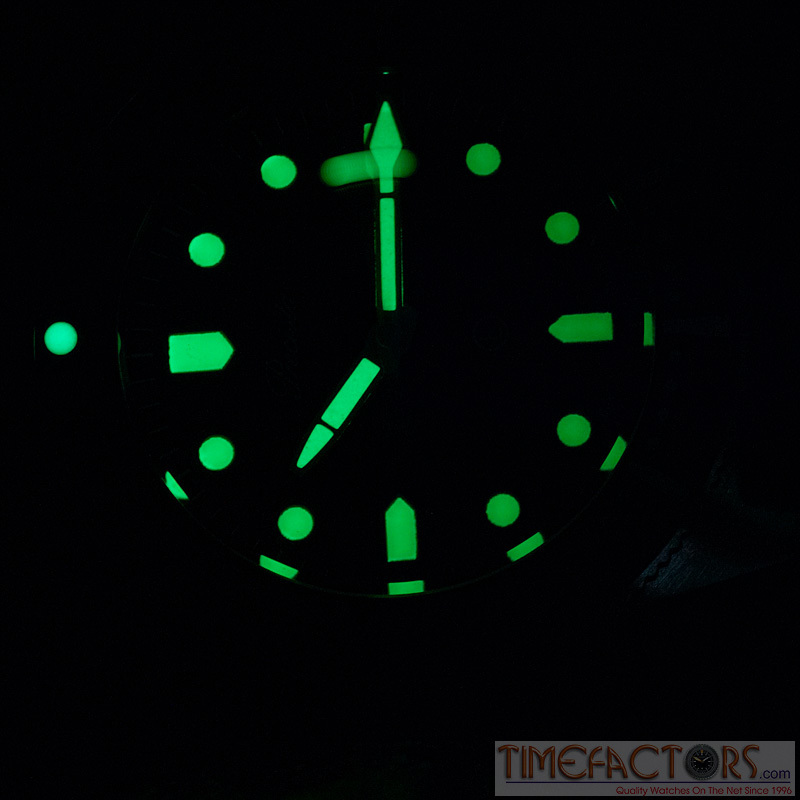 Turning to the hands and dial then these are very true to the original, perhaps slightly bolder hour markers and with the classic snakehead hands – everything featuring an aged Super Luminova coating. ‘Instant vintage’ as I like to put it but with modern practicality and great luminosity. It is good to see that the Luminova has been applied to a white-painted background; this both looks ‘right’ and serves to aid luminosity a little during the dark hours. In addition, the bright white-painted hands set off the Luminova within them very well, providing a contrast which matches that of the hour markers and their white backgrounds – small details but they can make all the difference between a hand/dial set that ‘works’ and one which doesn’t. Some viewers may notice that the Precista font has been very slightly simplified on this release – this applies primarily to the letter ‘P’ which has lost a few of its curls! It looks good and if anything, very very slightly more modern that the ‘P’ which I know and love. Again, a small detail but one which serves to aid and abet what to me looks like a beautifully balanced and proportioned dial. To finish off the package the Precista PRS-82 is supplied as standard on a silicone strap with a signed stainless steel buckle. 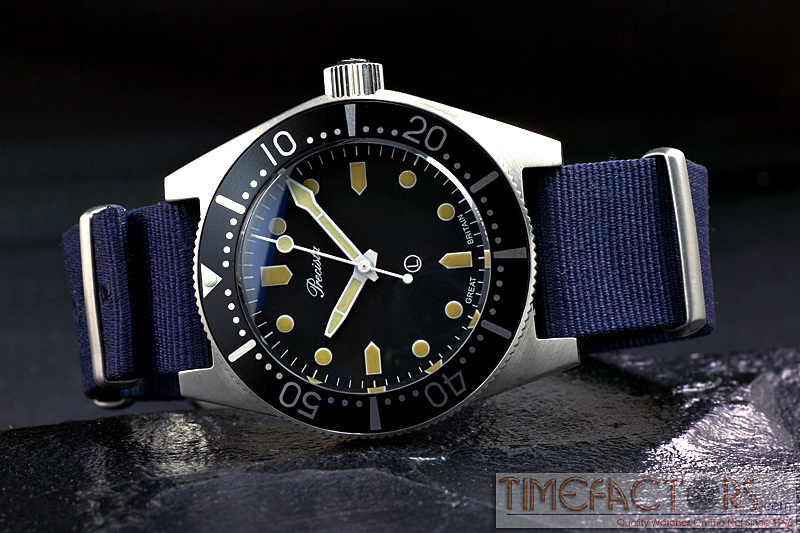 No doubt of great quality but my first task would be to get the watch on a mil strap of some description; not just because the original was thus – only because my wrists are too puny to carry off a thick silicone strap! 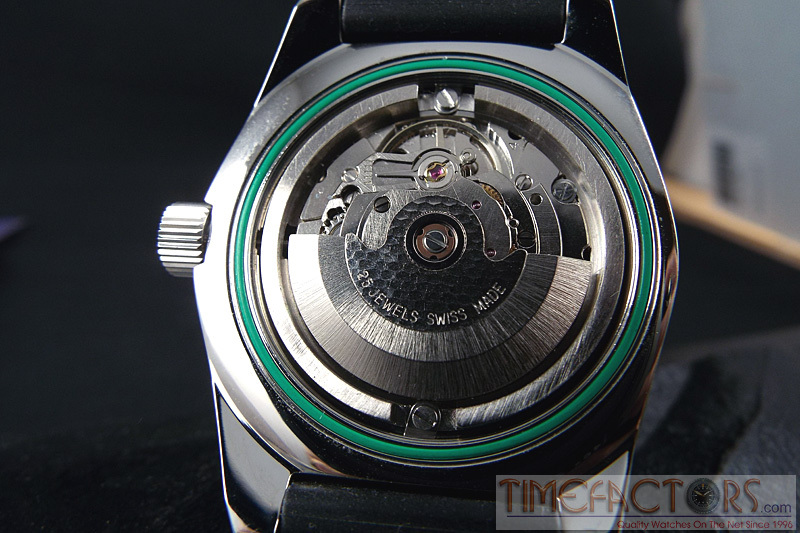 I mentioned toward the start of this post that 200 movements had been sourced for this project; that would by definition translate into 200 watches available (minus serial number 0001) = 199. Should Timefactors decide not to continue production of the PRS-82 using a modern movement, then as per the original Speedbird and Dreadnought, it could very well become a collectors piece. Indeed, given that it houses the movement that it does, whatever happens later, I think this version will become very sought after, very quickly. The only place to get it is at the Timefactors site and I think there will be a long queue for this one! Tagged ETA 2783, PRS-82, Royal Navy Diver. Bookmark the permalink. 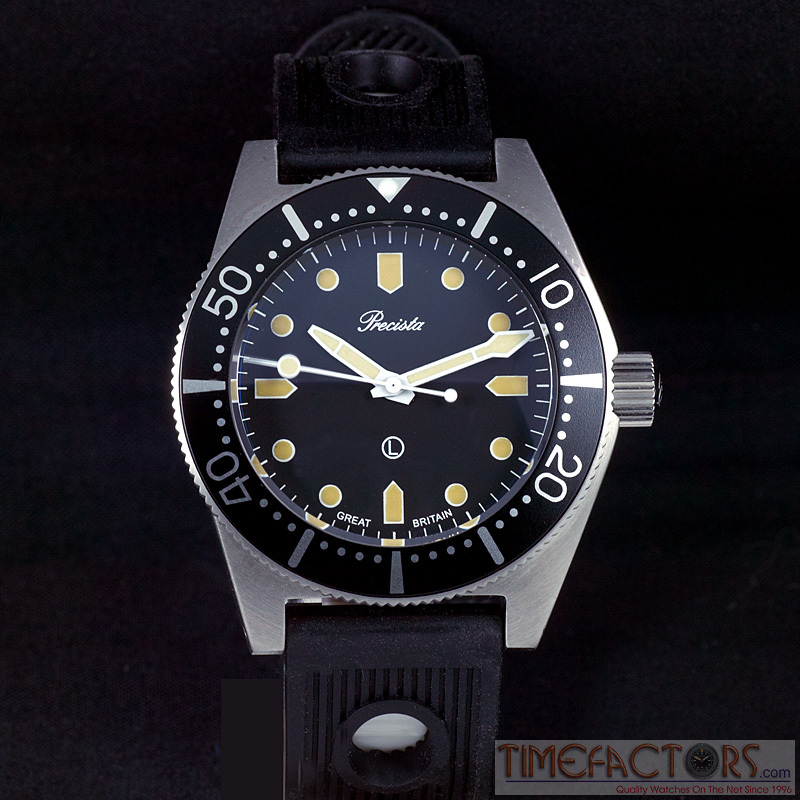 Smiths Diver PRS-68 Review – The New Seiko 6105? Dreadnought Voyager GMT – PRS-21 Imminent! All Contents of this site Copyright Watcharama.com. Reproduction of text or images is strictly forbidden without express prior consent.